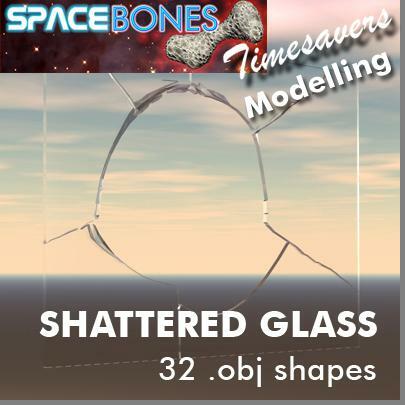 This set of broken glass shapes consists of 14 window`s edges shapes and 16 complete window shapes with customizable crack spots and / or holes. Bonus are two bullet hole shapes, single and double. Experienced modellers will know how to get on with them, but for the novice I provide a little "how to" in the attached .jpg named "customizing dimensions". It is assumed that the user has a modelling software for that (Though you can take the stuff as is, of course). Some objects consist of two parts, called "screen" and "cracks" - this is for reasons of easy scaling the screen for your respective need and / or having more flexibility when importing in DAZ Studio or Poser, as you can load both shapes independantly. They should match automatically, if not there should be no problem to send them into place ;-). In some occasions this can give better results, especially when applying different shaders to each object either, for instance a simple glass shader to the screen and a slightly luminous glassy one for the cracks object. This can be helpful with difficult lighting situations within your scene. if the straight planar shape doesn`t matter, some of these could do the job. I was looking for pieces of scrap metal to simulate debris around the 1947 Roswell UFO crash. Think I can apply a shiny metal mat to these shards and it will be just the ticket! piratemayur (2 years ago) Inappropriate? an absolute must have! useful in many settings, an really well made! thanks a lot! Delbert Moore (3 years ago) Inappropriate? Blaine91555 (4 years ago) Inappropriate? Useful and unrestricted, how cool is that. Thank you so much!!! Incredibly useful set of props. arteandreas (5 years ago) Inappropriate? OMG (Schnappatmung) - just what I was looking for! Thank you VERY much for this set and the whole 'Timesavers' series! Thebes (6 years ago) Inappropriate? alessandra (6 years ago) Inappropriate? I come hunting around for something I could really use, and go, "Oh, of course. Spacebones made one." Thank you for all the things! Blaine91555 (6 years ago) Inappropriate? Now this is Hot!!! Thank you!!! toasterkat (6 years ago) Inappropriate? Woo! Thanks so much. These are excellent! butterfly8000 (6 years ago) Inappropriate? as always Spacebones, fabulous as usual. Do you have a site of your own? EnglishBob (6 years ago) Inappropriate? How did you know I wanted this? :-) Thanks! as usual you have done a fantastic job yet again. Thanks for these. You always come up with props that we never knew we desperately needed. Thank you, again.